Finally, an Answer Me series with the mystery husband of my choice! Third times the charm and as exaggerated as this may sound, it feels so, so good to get the end couple you've been rooting for. I can say with certainty now that while people might claim who the husband is doesn't matter, it totally does. After all, when you sink over 30 hours of your life into a show, you're looking for a payoff that's satisfactory and squeal-worthy, which you can only have if the guy you're rooting for gets the girl. Plain and simple. I think I've also learned a thing or two about my drama tendencies, which includes the fact that at the end of the day, no matter how much I try to talk myself into staying neutral with a love triangle, I just can't. I'm going to pick a side no matter how great both guys are, and once that preference is formed there's no changing it, no matter how many heartbreaks or cute moments the other side gets. But I think that's true for all of us, which is probably why some of us are leaving 1988 feeling giddy and melancholy (aka Team Taek, who I think is a silent majority and aka Former Team Chilbongie) while others are leaving feeling bitter and cheated (probably Team Jung Hwan). I know plenty who are swearing off the Answer Me series for good, but honestly, I loved everything about this season and am so glad I came in and watched it despite my huge disappointment and frustration with 1994. If they keep the series maturing and building in this trajectory, I really won't have any problems with the future series (caveat that they better give me my choice of guy next time as well). Looking back on the series as a whole, there was such an abundance of thoughtful moments and heartrending relationships. Those are what make this series one of my top dramas, for as I've mentioned before 1988 managed to make you feel like watching it was an enriching activity. I truly think everyone has something to learn and gain from seeing the outpouring of love and acceptance from the people in this story, and for that I recommend that everyone gives this series a go. Not to say that I enjoyed every minute of the show or that there weren't useless scenes, because unfortunately with hour and a half runtimes you inevitably get plenty of filler and lame jokes that make you ponder why you're watching. The pre-time gap episodes suffered most strongly from this, as it was obvious the writer was delaying the good stuff and just biding time for the time jump. That said, at the end of the day I feel inspired (though also sad) after sitting through this journey and realizing that the time period and our characters will no longer be a part of my weekly routine. While I generally liked all of the episodes, I can say that episode 19 was my clear favorite, as you really just can't beat that Beijing confession scene. This was probably one of my favorite OTP scenes in all kdramas, as it was so freaking cute and chemistry-laden. But when I think back on the series as a whole, I'm left wondering if Taek really was a predetermined end-game or if the writer chose to mold the ending to the fanbase, unlike what she did with the prequel series where it was clear she had the husband planned from the get go. My sense when reading comments about the show was that Taek's fanbase was bigger than Jung Hwan's (much as Chilbongie's was larger than Garbage's). However, I also felt that the early episodes were almost certainly setting Jung Hwan up as the husband. The future husband behaved just like he was mimicking the young Jung Hwan, and Taek doesn't even start getting meaningful scenes until several episodes in. I can't imagine this writer going in with the premedicated plan to have Taek be the end game yet hold him off like she did Chilbongie for so long (unless she purposely did it to return love to the Chilbongie fans). Combine this with the fact that Duk Seon really didn't start showing any interest in Taek until about episode 16, which may have been late enough for the writer to recognize the fan love and shift gears. Park Bo Gum and Hye Ri also just had far stronger chemistry than Hye Ri and Ryu Joon Yul which may have played a role. Just something to ponder, and I'm certainly not complaining with the outcome. But while Duk Seon would likely have been happy with either guy (they were both great, no one can deny that), ultimately you can see how Taek is the best for her. She crushed on Sun Woo and Jung Hwan because of her friends, but did she really know either of them like she did Taek? 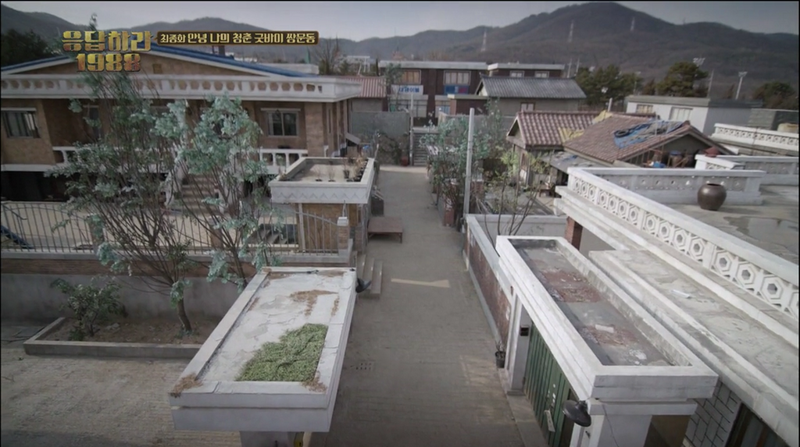 Yes they were all neighborhood friends, but she and Jung Hwan had little dialog or true interaction with each other. He may have loved her, but their dynamic and familiarity with one another didn't hold a candle to her relationship with Taek. You can see the resemblances between her dynamic with Taek and that between Taek's father and Sun Woo's mother. Duk Seon grew up caring for Taek, and ultimately came to realize that the boy she had cared for had grown-up and could correspondingly take care of her. I believe it's clear she fell for him in the moment when he picks her up and runs with her, and while this came late in the sequence of the series, it was significant in that it was the first time she started seeing someone romantically on her own, without any outside influences. 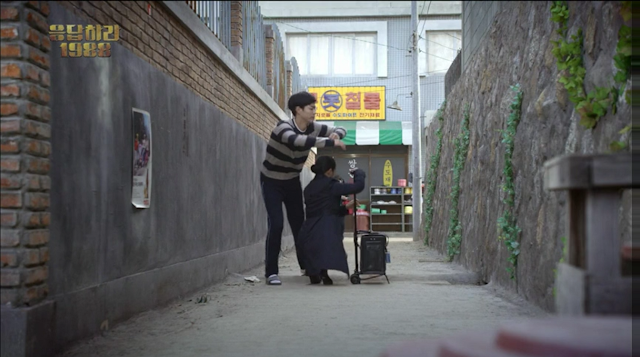 OTP happiness aside though, the rest of the final episode was honestly pretty heart-wrenching. You get the Bora-Dad wedding tearfulness plus that absolute gut-punch of a series closer, with the empty street and the memories of youth. It was both beautiful and painful to watch, and I can only imagine how I'd feel if I were watching this as a member of Duk Seon's generation. This would be the challenge to making another sequel in the series with an even earlier timeframe, because it must be so hard to realistically frame and reflect the period in a way that relates to the people who lived through that generation. I actually liked the actual finale, episode 20, far less than most of the other episodes in the show. First as I've mentioned, it was too darn sad to watch, like gut punch after gut punch. Secondly, most of the episode revolved around Bora and Sun Woo, a couple that I frankly never cared for. Why couldn't we have spent some of that time with Taek and Duk Seon's development instead? I felt like our OTP got shafted for this secondary pair that might have featured better actors (debatable though given Park Bo Gum) but had a far more predictable and dull storyline. I wasn't a fan, and the whole last-name drama was also a bit unnecessary, especially as we all knew by this point that it wasn't going to be any true barrier to their marriage. Episode 20, while beautiful, furthermore failed in giving us any true conclusion. Only Bora and Sun Woo got a nice wrap-up, everyone else was left almost too suddenly. 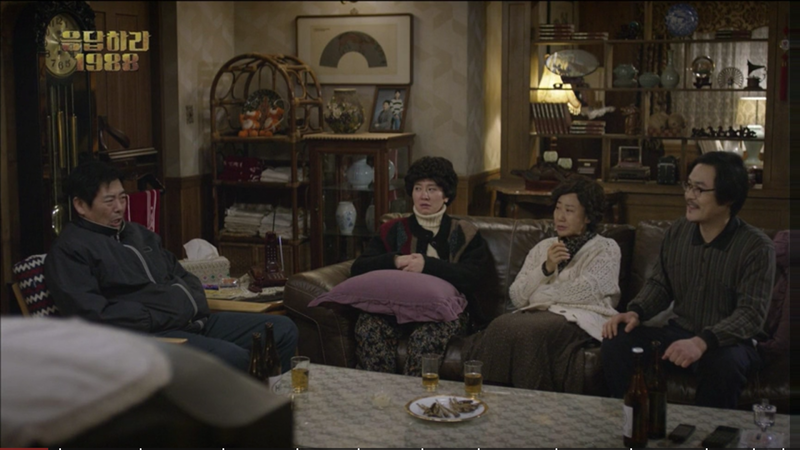 We don't get more than a few glimpses of Taek and Duk Seon's relationship, while I wanted to see them reveal their status to their parents, and to get married on-camera. Why??? We had it in 1994, why couldn't we do it with 1988? Similarly, I would have liked to see rather than just be told where people were. I get that hiring a second cast of older actors would have been difficult, but darn it that's what I as the viewer want in order to truly say goodbye to these characters. Truly though, 1988 was a unique and innocent time, that's far back enough but also entirely real for half the people around today. I can't really imagine such quaint neighborhoods or people marrying their first-loves now, but in that era it seemed entirely plausible. Relationships and love grew so innocently, and neighbors were like family. It really is sad to say goodbye to such a time, and to such a warm cast of characters, both in the old and young generations, but the time has come. 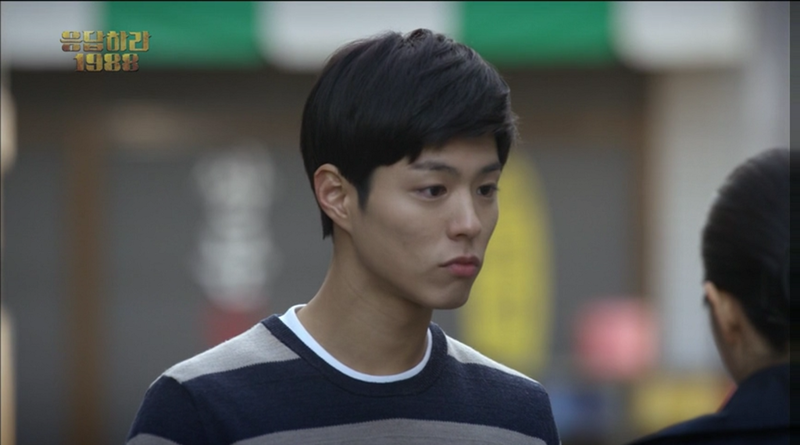 Now I need Park Bo Gum to quickly pick another role so I can get him back on my screen.